McLean Hallmark Insurance Group Ltd., is a Toronto-based insurance broker that provides comprehensive insurance coverage for clients throughout the Greater Toronto Area. Their ‘Solutions Beyond Insurance’ approach focuses on clients’ total cost of risk and helps them access an extensive network of resources, both internal and external, to offer professional guidance and advice on a broad range of matters related to personal and business asset protection. Recently, McLean Hallmark was awarded Ontario government grants to support advanced user training on their Epic Cloud enterprise resource planning (ERP) platform. By providing this training to 28 employees within the organization, McLean Hallmark will better manage customer relationships, increase sales automation, and improve financial accounting processes. The company has been awarded over $41,000 in Ontario government funding through the Canada-Ontario Job Grant (COJG) to support advanced ERP user training. Advanced ERP training is one area that can be difficult to access funding for through the Canada-Ontario Job Grant, since new rules have been implemented over the past year to limit implementation, or ‘basic’ user training. Because of this, McLean Hallmark requested the support of Mentor Works to help prepare a competitive application. This relationship was a key reason why McLean Hallmark accessed funding and provided employee training, since without government assistance, the training would not have been possible. Insurance brokers operate in a competitive environment where increased automation and intelligent data processing are essential to success. Managing customer relationships and keeping sales teams on track can be incredibly time and labour-intensive without visual pipelines intelligent workflows, which is why ERP systems make so much sense for the insurance industry. As a top insurance broker in the Greater Toronto Area, McLean Hallmark has been drawn to automation and business intelligence systems to drive their competitiveness and improve customer relationships. The company’s past implementation of Applied Epic, a brokerage management ERP system, is a testament to this automation strategy. – John Belyea, Chief Operating Officer of McLean Hallmark Insurance Group Ltd.
To further improve the ERP system’s benefits and usefulness, McLean Hallmark recently developed plans to train 28 ‘power users’ within the company on advanced system features. This will help the company maximize their ERP investment and drive long-term growth through superior data-driven decision making. Through the Canada-Ontario Job Grant, McLean Hallmark will reduce the costs of providing specialized training to employees by up to $41,008. Applied Systems, developers of the Applied Epic platform, were selected by McLean Hallmark to provide this advanced training. Through on-site and online learning modules, Applied Systems will provide trainees with the skills needed to improve system use and train new employees. McLean Hallmark’s leadership team were aware that government funding can support third-party employee training programs, which is why they immediately sought funding for their advanced ERP project. Having written a successful Canada-Ontario Job Grant application internally in 2016, they wanted to apply again and access up to 66% of training costs. But despite their interest in pursuing funding and past success, the company’s executive team decided to partner with Mentor Works to help navigate the funding process. Earlier in the year, a member of McLean Hallmark’s executive team attended an event where Mentor Works was presenting and talked in-depth abought COJG funding. It was during this event where they learned about changes of rules to COJG and thought that the process would be better left to Mentor Works than internally. Through working with Mentor Works’ team of Government Funding Planners™, McLean Hallmark streamlined the process of developing an application, submitting to a local service provider, and explaining follow-up questions asked by reviewers. Having navigated the government funding process internally, as well as with Mentor Works, Hallmark McLean Insurance can attest to how much less time and resources are required to access funding. By requesting comprehensive support to cover the program’s application planning, submission, and follow-up reporting requirements, McLean Hallmark optimized funding efficiency and got the most out of their training initiative. 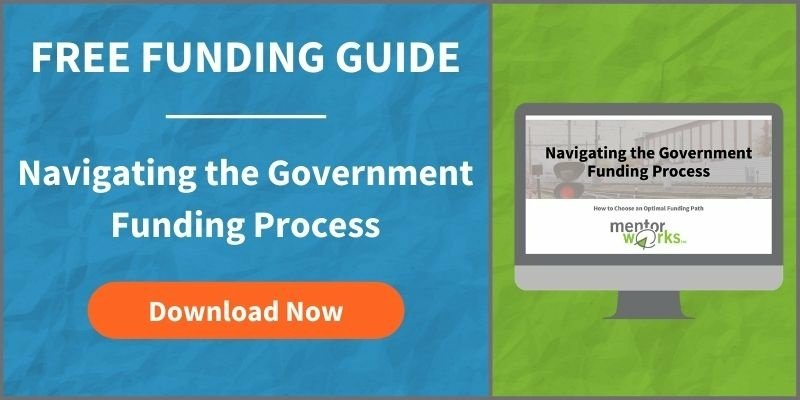 To learn more about how Mentor Works can optimize the funding process for your upcoming strategic projects, download our Navigating the Government Funding Process slide deck.